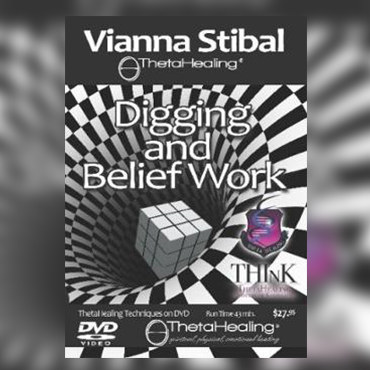 This ThetaHealing Digging and Belief Work DVD features one of the Techniques ThetaHealing is most known for, created by Vianna Stibal. In this DVD Vianna shows different examples of how to use the digging technique on different situations and make powerful changes in your life. All the information found in this dvd is for educational purposes only! None of the information is intended for diagnoses, prescriptions or to replace medical advice or treatment. 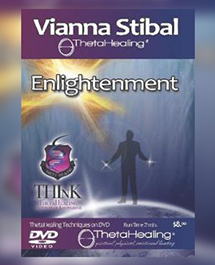 In this enlightenment dvd Vianna will explain her personal opinions and perspectives of theta brain waves and why they are so benificial to the ThetaHealing® technique, a way to connect with The Creator of all that is! Learning how to work on the body, mind, and spirit can be very challenging but through this technique, anything is possible! Vianna will also briefly explain different activities that we all do every day that will put our brain's in a theta state of mind without our consciousness evan being aware of it! Manifesting your dreams goals and desires has always been a very big part of ThetaHealing® and she expresses that as well. Compassion for one another is the key to success in obtaining your manifestations for yourself and or your clients! Whether it's a healthy body, more money or just a stronger connection to a higher power of your understanding, you will both begin to see changes when we fill our beings with love, understanding and compassion! I believe that if we all learn how to truly appreciate and love unconditionally which is easier said than done, we would truly find inner joy and peace and always stay connected to the creator of all that is, through the ThetaHealing technique. This was filmed in March 2011 at a Sivananda Ashram, as part of an all night chant and meditation, dedicated too Shiva and Parvati's wedding anniversary! This is a live and very rare workshop! So again, excuse Vianna! She is very tired but this information is very explanatory and informative if trying to understand Theta brain waves and why they are so important to the ThetaHealing technique. Allow 1-2 business days for your order to process. All orders shipped from the US. 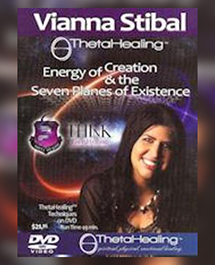 In this DVD Vianna Stibal, Founder of ThetaHealing® talks in length about the foundation and beginning of ThetaHealing®. Vianna talks about the Seven Planes of Existence and explains how they all work together. While in her magical labryrinth, in her back yard, she shares with the viewers the essence of the work she has developed the last 15 years. Manifesting has always been a very important part of Vianna Stibals life and through her connection with the Creator of All That Is she has manifested true abundance in every aspect of her life for the past 17 years. In this Revised and Expanded Manifesting & Abundance DVD, Vianna incorporated all of her personal secrets to Manifesting as well as thoroughly covering all of the most important exercises from the Manifesting & Abundance Class. This information is designed for all levels of understanding and works extremely well with other Modalities and religions. Every Goal, Dream or Desire can be Manifested through clearing blocks, Imagination and a little dedication, we can create our own reality. These Techniques have helped thousands of people achieve what they once believed to be impossible and were only available if you took the ThetaHealing® Manifesting & Abundance Class. Vianna is now making this information available to everyone, because she truly believes we all have a divine right to connect with the Creator of All That Is and produce positive results in every aspect of our lives. Spiritually, Physically, Emotionally, Mentally, and Financially. Manifesting in ThetaHealing® is the belief that it is possible to create anything in the physical world, for your highest and best way using the power of the Creator of All That Is. This DVD is most beneficial if you have read the ThetaHeailng® and Advanced Thetahealing® or if you are a certified ThetaHealer®. This DVD does not certify you as a Manifesting Practitioner, but to complete the full Manifesting Class you can find a Certified ThetaHealing Instructor on www.thetahealing.com Allow 1-2 business days for your order to process. All orders shipped from the US. Combine and Save with this 3 DVD set of ThetaHealing DVD's : ThetaHealing Techniques- Energy of Creation DVD ThetaHealing Digging and Belief Work DVD ThetaHealing Manifesting and Abundance Revised and Expanded This is a great package for anyone wanting to learn more about the ThetaHealing Technique. Combine and Save $12.00. Allow 1-2 business days for your order to process. All orders shipped from the US.